Farid El Alagui continued his comeback from injury and Jamie Insall made his first appearance as a Hibs player in the Hibs Development Squad’s 1-0 defeat by Ross County. The forward pairing endured a frustrating opening 30 minutes in Dingwall as the Staggies dominated and took the lead through Blair Malcolm. From the 30th minute onwards Hibs were on top in the game, limiting the hosts to counter-attacks. But Malcolm’s goal ensured victory for Ross County at the Global Energy Stadium. County dominated a rain-sodden opening 15 minutes as Tony Dingwall, Ian McShane and Darren Moffat all had attempts on goal, but either fired wide or were thwarted by Hibs keeper Sean Brennan. Insall and El Alagui then became more involved as Hibs began to break free from County’s grasp, but the visitors themselves under pressure again. First Ali Smith made a fine goal-saving challenge to deny Darren Holden, but in the 22nd minute the Hibs resolve was finally broken. Malcolm controlled a high ball brilliantly, and then curled a fine effort into the top corner. Brennan was able to save a Dingwall header, before Hibs ended the half strongly as El Alagui and Smith fired over and Oli Shaw had a low shot saved. The second half was entirely dominated by the visitors, with Ross County restricted to counter-attacks. 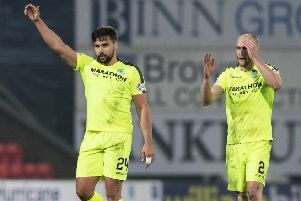 Adam Watson curled over the bar from Insall’s lay-off, before Shaw struck a first-time effort off-target as Hibs chased an equalising goal early on. Insall was again involved as Fraser Murray fired over the bar. Steven Miller had a penalty appeal waved away and then came Hibs’ best chance. Jordan McGregor headed on a corner to Insall, but his shot was blocked on the line and hit the bar before being cleared from inside the six-yard box with 15 minutes left. Despite the dominant performance, Hibs could not find an equaliser and fell to their fourth defeat of the season. Hibs Development Squad: Brennan, Dunsmore, Stirling, Waugh, McGregor, Scott, Smith (Murray, 45), Watson (Breen, 76), El Alagui, Insall, Shaw (Duthie, 79). Unused substitutes: Scott, Campbell.